In collaboration with Portland-based printer Premier Press, I pulled together a group of local designers, illustrators and photographers to showcase some of Premier's processes and papers in a fun, collaborative way. We came up with the theme "Good Stuff," and a packaging system, 2013 calendar, double-sided wrapping paper and a 20' x 14' wall banner were created. Contributors include Nishat Akhtar, Thomas Bradley, Kate Bingaman-Burt, Will Bryant, Ben Clark, Jordan Domont, Nicole Lavelle, Tom O'Toole, Aaron Rayburn, Michael Spoljaric, Ryan Unruh and Everett Vangsnes. Photography by Ryan Unruh, with photo assistance by Matthew Jones. After pulling open the perforated tab, the complete 6" x 9" collection is revealed. The back of each card gives the artists' information as well as a description of that card's particular print processes and paper stock. 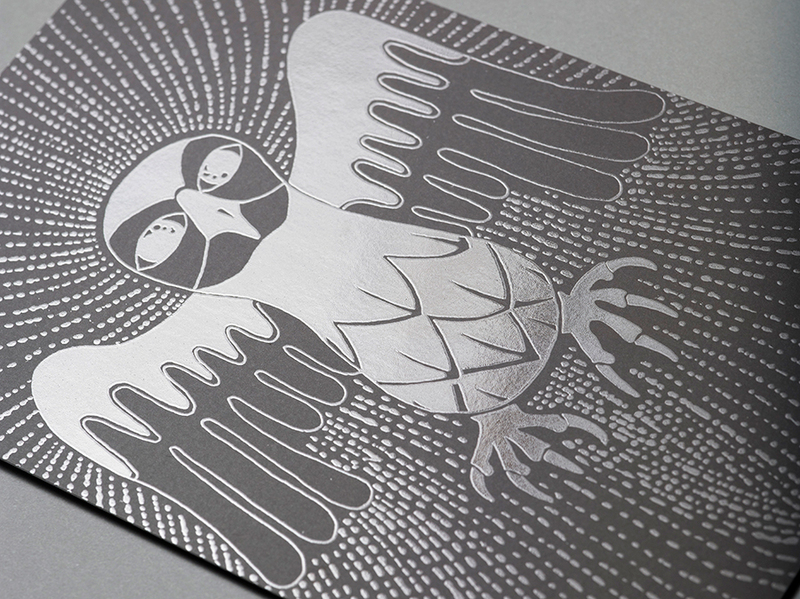 Aaron Rayburn's "Dream Eagle," with UV coating on black ink. Ben Clark's "Infinity," debossed, embossed and UV spot varnished. 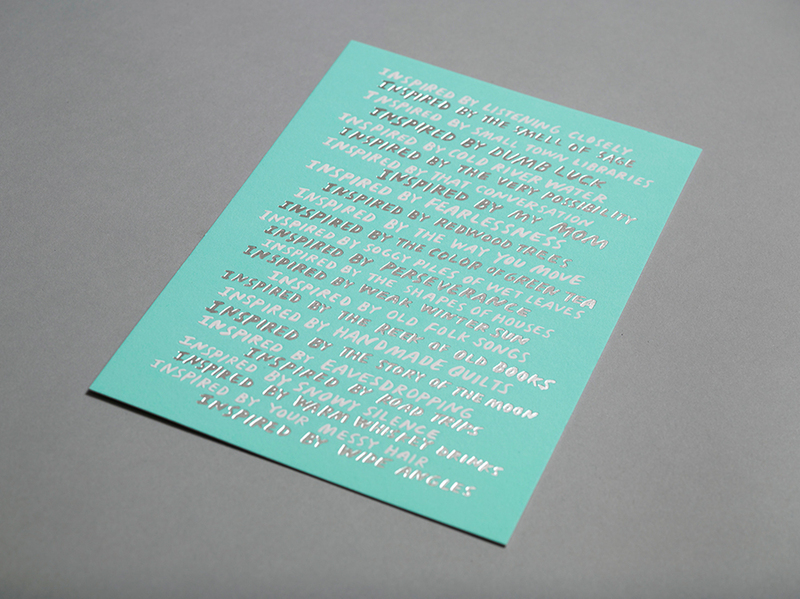 Nicole Lavelle's "Inspired by Weak Winter Sun," silver foiled and embossed on a pastel flood on cotton stock. 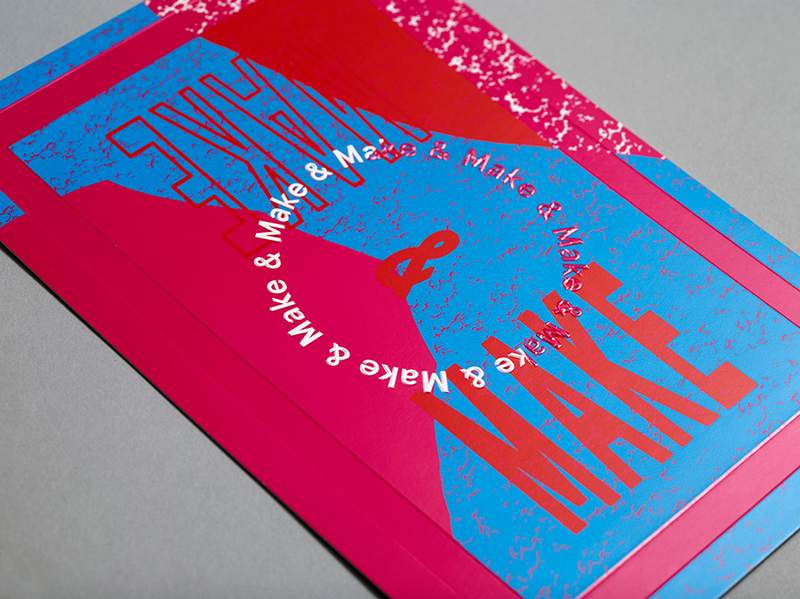 Nishat Akhtar's "Turn Lead Into Gold," gold foiled on a gloss cover stock. 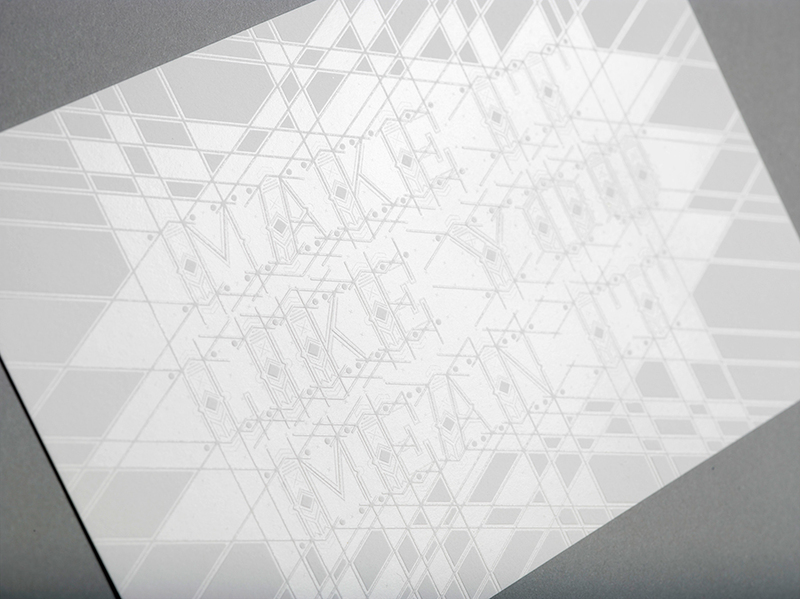 Thomas Bradley's "Make It Like You Mean It" effect is from a clear foil debossed into a Reich cotton stock. 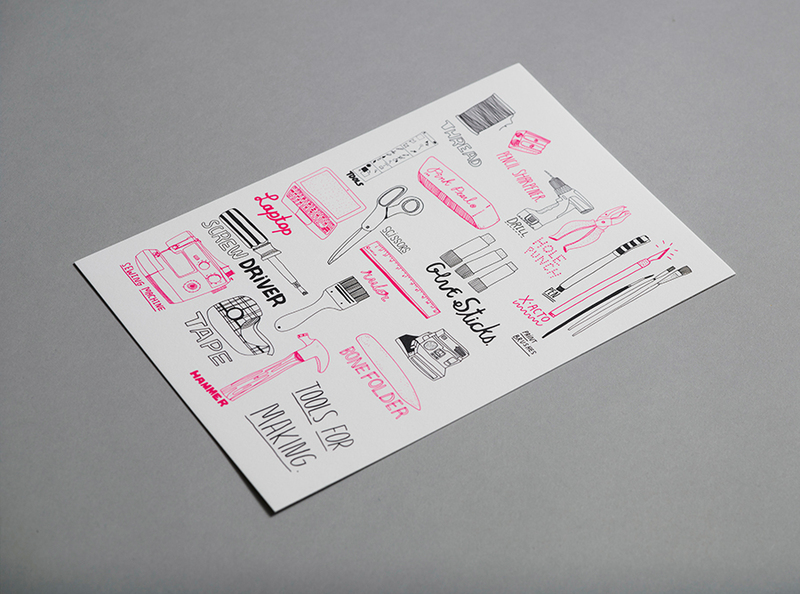 Kate Bingaman-Burt's "Tools for Making" is a fluorescent pink and black on cotton stock. Michael Spoljaric's "Genus of Three and One Extinct" is a four-color process on rainbow halographic film. Tom O'Toole's "Create or Die" is an emboss reversed out of a red flood. 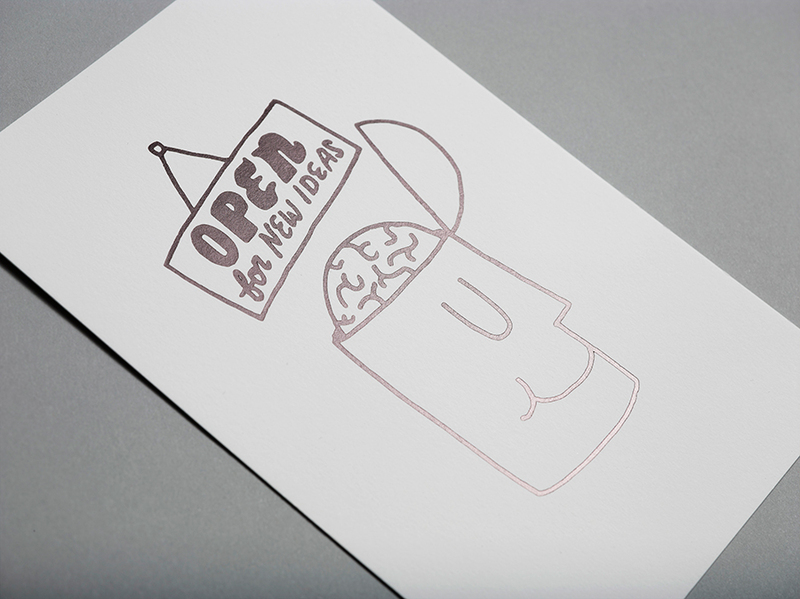 Will Bryant's "Open for New Ideas" is a gloss black foil on a 100% cotton stock. 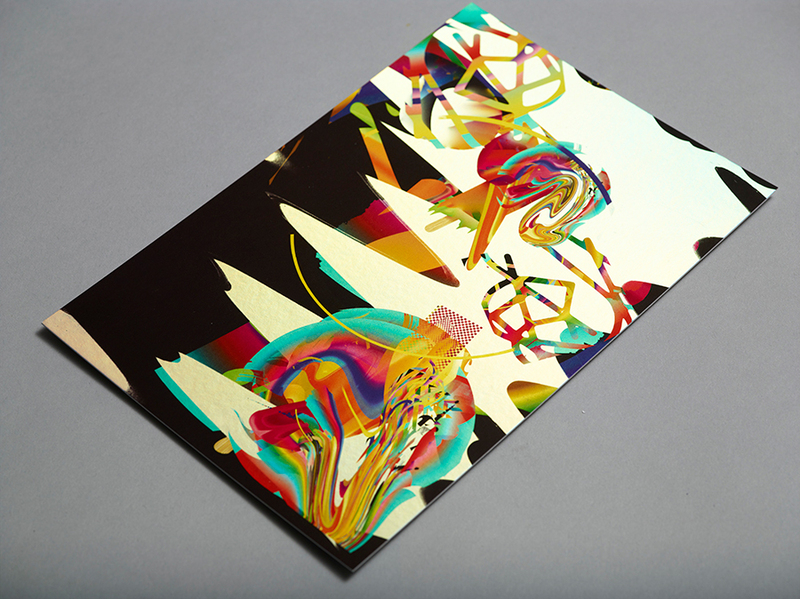 Jordan Domont's "Happy Accidents" is a spot gloss varnish on four-color printing and soft touch coating. Ryan Unruh's piece is a four-color print with a flood-gloss UV coat.